How are these waterproof wireless earbuds only $18 on Amazon? OK seriously, we’re not sure if this is some kind of mistake. Whatever the case may be, you should take advantage of this deal as soon as humanly possible. 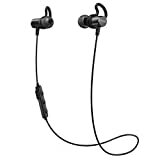 The Anker SoundBuds Surge Lightweight Wireless Headphones typically cost $28 on Amazon, which is a fantastic price for high-quality Bluetooth earbuds with sweat-proofing and solid battery life. If you use the coupon code SUPER236 at checkout, however, the price drops all the way down to just $17.99. Hurry! No Sweat: Water-resistant nano-coating ensures sweat stays out of your earphones throughout workouts. What You Get: SoundBuds Surge, Multiple EarTips, Multiple Wingtips, Cord Management Clip, Shirt Clip, Carrying Pouch, our worry-free 18 month warranty and friendly customer service.